I would have scene that take's place in Gotham City. That we see her standing on roof top of building in Gotham City and see her sweeping down in alley and taking down couple of bad guy's. I like that idea, I am curious if this will have her origin in the crossover, of if they will wait to do that on her show. 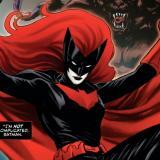 My thinking is that Batwoman will either have to find the arrowverse’s current heroes, or they will enter her path chasing down a shared threat. I think the best idea would be to have the crossover take place after the pilot, with Kate already being Batwoman. That way, the crossover isn't essential to her story in her first season. Then have the pilot be her origin, and continue from there, having the crossover take place, perhaps, between episodes 1 and 2.